Petsmart.com is having some interesting deals going on now (until Thanksgiving morning - November 27, 2014) and then for the Black Friday push to Cyber Monday. Right now, until Thanksgiving, they have 40% off of certain items, and are offering 20% off on top of that (or 10% off of food, tick or flea stuff) for online orders. They also have a $5 bonus if you spend over $35 on pet basics like food, treats or litter. You can buy online and pick it up instore or get free delivery on eligible items if you buy $49 or more. So one deal that has caught my attention is the sale they have right now on Blue Bones Dog Treats, which are 60% off regular prices. What is great about this deal is that it qualifies for the Buy $35 and get $5 deal for your next purchase (which is the rough equivalent of another 14% off). So if you buy $70 worth of pet foods and eligible items that are currently on sale (making sure to get the Blue Bones Dog Treats), I think you have a good deal going. If you buy just the Blue Bones Treats, you'll be getting them for about 65% off of regular prices. Starting Thursday 7 am, there is free shipping with no minimum amnount required. The best deal they have will be for Purina Tidy Cats Cat Litter - a 35 pound pail for $7.99 instead of usual $14.99. An excellent deal so try and stock up!! They will also be offering 50% off of certain pet treats, rawhide and chews. They also have 50% off holiday dog and cat collars, clothes and accessories. If you need aquarium supplies, be on the lookout for 50% off of certain power and canister filters and aquarium sets. You can see the details starting on Thursday, November 27 at 7 am at Petsmart.com. On top of all of their sale items, Petsmart is offering a card link offer for $5 Back for $25 purchase. The details are here. If you stack this with one of their super discounted items, you'll be getting a great deal. On Petco.com, right now, they are offering $5 off of your $25 purchase with the coupon code 5off25 (expires November 26, 2014. If you need a pet gate or door, their entire stock of them are currently 40% off. For two days - Friday, November 28 and Saturday, November 29, the best deal they have going is their entire stock of Petco Brand Textured Round Pet Beds will be 50% off. I am not seeing anything else that looks like an amazing deal at Petco.com, but you may want to check it out yourself. For this shopping season (and the sale is going on right now), Amazon is offering up to 30% off of many Hill's Science Diet Products. It is not one of our recommended dog foods (see Top 5 Best Dog Foods Reviewed and Top 5 Best Cat Foods Reviewed), but if this works for your dog or cat, you can get a great deal on many of the brand here. Amazon is also offering up to 20% on certain Milk Bone Treats, 20% off of Nylabone products and 20% off Dingo Treats. Again, nothing awesome on this list but if you are a fan of their products, it's a good time to stock up. If you need pet food storage containers, Amazon is also offering 20% off on certain Iris Food Storage Containers. look at getting something with this sale. I've only highlighted a few items, so please click to see all Black Friday and Holiday Deals for cats, dogs and other pets at Amazon. In my rush to get this information out to you, I may have missed some details or great deals. Please share your great finds and suggestions for making this Black Friday shopping season a great one for pet owners. 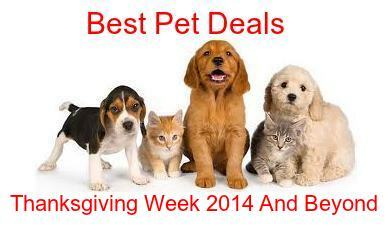 I will be updating this article if I find additional great pet deals to share with you.